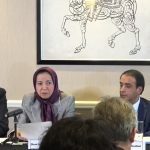 On September 12th, 2018, the UK office National Council of Resistance of Iran (NCRI) held a press conference in London. Within it, the Iranian opposition organization shed light on the terror activities of the Iranian regime in Europe. The NCRI has evidence to suggest that these activities are carried out by the Organisation of Foreign Intelligence Movements. The organization is a sub-division of the Iranian Ministry of Intelligence (MOIS). It also has proof that senior members of the Iranian leadership have been involved in the architecture and planning of terrorist attacks on European soil including the very recent foiled plot to bomb MEK‘s rally in Paris. The regime knows that prominent European governments are keen to maintain the status quo. Khamenei, Rouhani, and the mullahs planned the attacks with the belief that European nations would not react adversely. The conference also addressed the ongoing question of to what extent the Iranian embassies in Europe are involved in the planning of ongoing terror attacks, suggesting they play a key role at different stages of the planning and execution process. The last nine months have seen a distinct increase in terrorist activities stemming from the Iranian regime. In March, a terrorist attack targeting members of the People’s Mujahedin Organisation (MEK) living in exile in Albania was foiled. Those responsible attempted to use a car bomb to attack thousands of MEK members gathered to celebrate the Persian New Year. Then, in June, an Iranian couple carrying explosives and a detonator were arrested in Belgium, along with an Iranian diplomat from the regime’s embassy in Vienna. The pair planned to attack the MEK’s Grand Gathering in Paris, where more than 600 dignitaries were gathered from more than 70 countries around the world. Most recently, in August, two Iranian agents were arrested in the United States. The pair stand accused of spying. They were collecting information on MEK members and Jewish centres within the US. It is believed they were carrying out surveillance ahead of a possible terror attack on US soil. It may be no coincidence that this flurry of terrorist activity has occurred in the wake of the birth of the Organisation of Foreign Intelligence and Movements. On February 8th, 2017, the clerical regime elevated the division from a directorship to an organization. As a result, the Organisation of Foreign Intelligence and Movements likely received a larger budget, making it one of the most prominent divisions of the MOIS. The Organisation of Foreign Intelligence and Movements is responsible for carrying out espionage and planning terror attacks abroad. It has constructed an extensive network of espionage through the establishment of intelligence centers abroad. The arrest of Assadollah Assadi, an Iranian diplomat working out of the regime’s embassy in Vienna, suggest that the organization also uses embassies in its nefarious activities. Assadi stands accused of proving the couple with the explosives, as well as detailed plans on how to carry out the attack in Paris. There is evidence to suggest that he has been head of the European intelligence stations since 2014. The NCRI has obtained information in recent weeks citing Reza Amiri Moghaddam as the head of the Organisation of Foreign Intelligence and Movements. Moghaddam was a commander in the Islamic Revolutionary Guards Corp (IRGC) during the Iran-Iraq war. He was also Head of the Iranian regime delegation during talks between Iraq, Iran, and the US following the coalition invasion of Iraq. This would put Moghaddam among the upper echelons of the MOIS leadership. He likely reports directly to the Iranian Intelligence Minister, Mahmoud Alavi. The revelation of Moghaddam as head of the Organisation of Foreign Intelligence and Movements helps paint a picture of the planning process for the June 30th terror attack on the MEK’s Grand Gathering in Paris. The Supreme National Security Council is the decision-making council which includes Intelligence Minister Alavi, Foreign Minister Mohammad Javad Zarif, Quds Force Commander Qassam Soleimani, IRGC Commander Mohammad Ali Jafari, among others. It likely put the plan forward for Khamenei’s approval. Once received, Alavi will have instructed Moghaddam to plan the attack. He will have taken these instructions to Assadollah Assadi at the embassy in Vienna and had him coordinate the planning and execution process. Assadi is an explosives expert with extensive experience in espionage and demolitions. He has been connected to a number of plots involving bombings and kidnappings. He is suspected of involvement in a 2006 terrorist attack in Iraq, in which 11 workers heading to Camp Ashraf died after the bus they were traveling in exploded. Assadi gave a terror sleeper cell in Belgium the necessary explosives and instructions but will have overseen the plan personally due to the sensitivity of the operation. Lord Maginnis : I remind you, Assadi is a diplomat. He is not some brain washed individuale who is sent out for terrorism. The attempted attack in Paris is concerning for a number of reasons. It has thrust Iranian embassy activities under a spotlight. The attempted attack demonstrates that the regime’s embassies in Europe occupy an integral role in the European terror network. They provide weapons, explosives, and money to the terrorists. They also provide a safe haven where perpetrators can hide after the execution of operations. The NCRI estimates few embassies in Europe have not been involved in the Iranian regime’s network of terror in some way. Another explanation for the heightened terrorist activity for 2018 is that the regime is under considerable pressure at home. A nationwide uprising in 2017 and 2018 opened the floodgates of discontent. Rouhani seems concerned. He has every reason to be. The protestors slogans have been scathing, with many shouting “down with Rouhani”, and “down with Khamenei”. The mullahs have laid the blame for the protests on the shoulders of the MEK. Ali Shamkhani, the Secretary of the regime’s Supreme National Security Council, promised that the MEK “will receive an adequate response from where they don’t expect it”. The reality is that while the MEK has mobilized the population, it is the mullahs’ mismanagement of Iran that has led to the people mobilizing in the streets. The regime has proven inadequate at meeting the needs of the Iranian people. The country is in the midst of an economic crisis. Poverty, corruption, and illiteracy are rife. Suicide rates are spiraling out of control. The MEK is the target of the regime’s terror network in Europe. The Iranian regime focuses on killing when it should be focusing on reform and improving the lives of the Iranian people. At the press conference, the NCRI urged the international community to stop the Iranian regime from threatening “the lives of Iranian refugees and opponents, and the security of European countries”. It proposes that those arrested in Germany and Belgium, including the Iranian couple and Assadollah Assadi, should face trial in Belgium without delay. It also urged European nations to close the regime’s diplomatic missions in Europe and for the regime’s mercenaries, agents, and spies to be “arrested, tried, and expelled”.